Distance: 6 miles | Hiking time: 3 hours | Difficulty: 7/10 | More info. 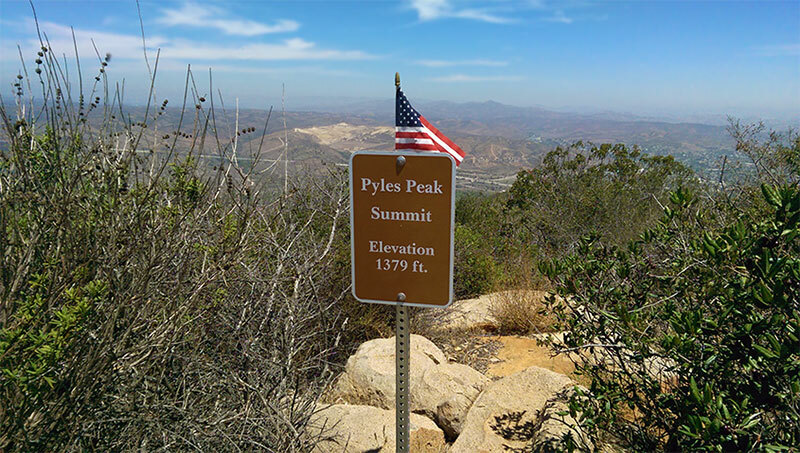 If you’re looking for a great way to beat the crowds of Cowles Mountain while enjoying similar views, and you don’t mind adding a few miles to your trip to do it, head on over to Pyles Peak. 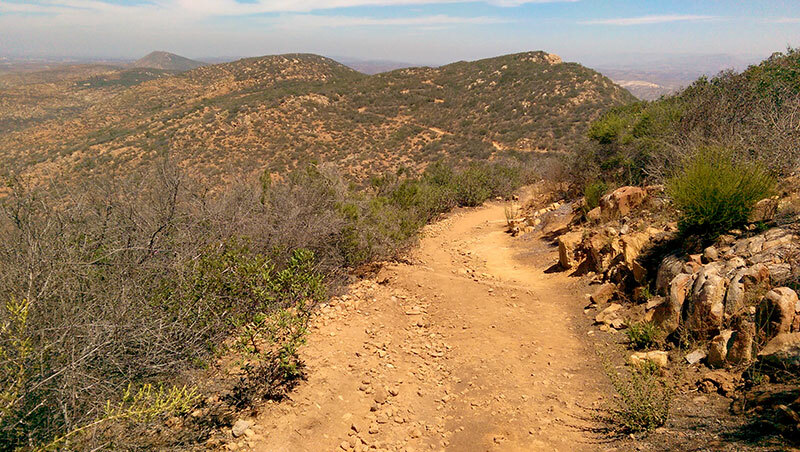 The extra mileage isn’t that demanding in comparison to the ascent leading to Cowles Mountain Summit, and the reward is a fun hike, with peaceful views to boot. 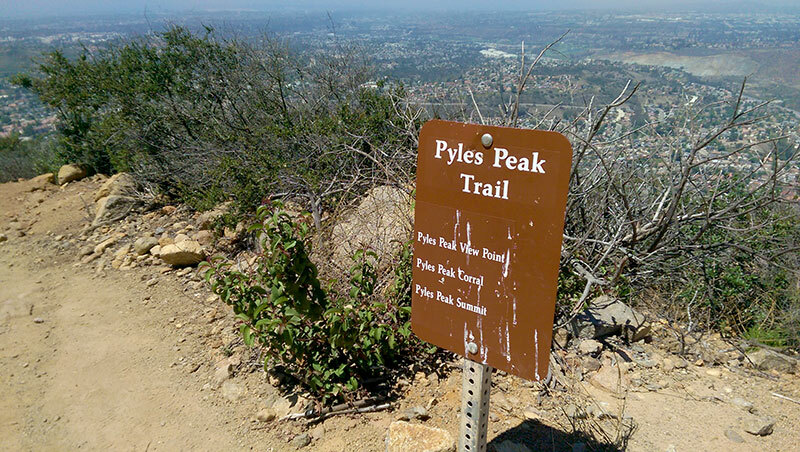 Pyles Peak sits 1.5 miles northwest of Cowles Mountain Summit in Mission Trails Regional Park. 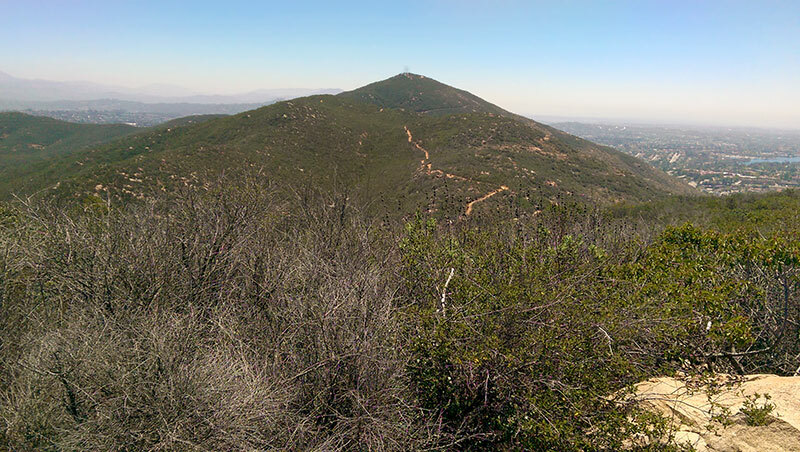 To find the trailhead from Cowles Mountain Summit, walk north toward the fire road that leads to the towers on the north end of the mountain. Follow the road west a few yards to the point where it curves sharply to the right. Right there, on the outer edge of the road is a small, nondescript trail sign marking the trailhead for Pyles Peak Trail. 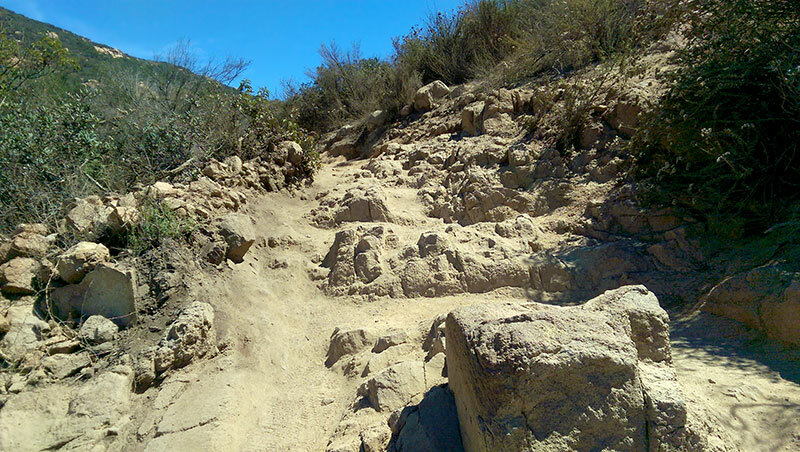 Step down into the chaparral and you are on your way to the best kept secret in Mission Trails. The trail descends quickly a couple hundred feet down the side of the mountain where it begins to track along the ridge between the two peaks. Just beyond the halfway point along the trail is another narrow, unmarked trail leading up and to the east. If you don’t mind taking a quick detour, follow the trail a couple hundred feet up and you will find a small clearing. The view to the north includes Pyles Peak, as well as clear views of Kwaay Paay Peak and both North and South Fortuna Peaks. 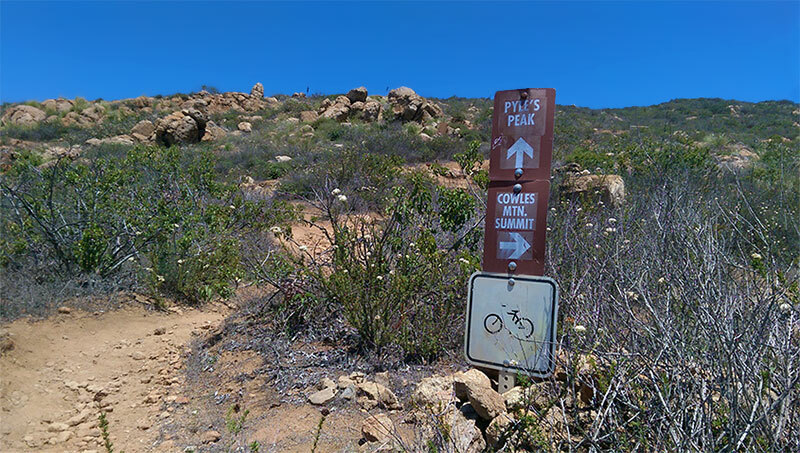 Continue following the main trail past the lookout and across the ridge until it reaches the base of Pyles Peak, where there is a trail sign directing weary hikers toward the summit. After a quick scramble up the hill, the summit marker for Pyles Peak comes into view. Take a boulder, have a sit, and enjoy the views in all directions. I’m not a huge fan of the Cowles Mountain hike. Despite the views from the summit, I’m always left wanting more trail, more nature, and fewer people. The hike to Pyles Peak gives me exactly that. 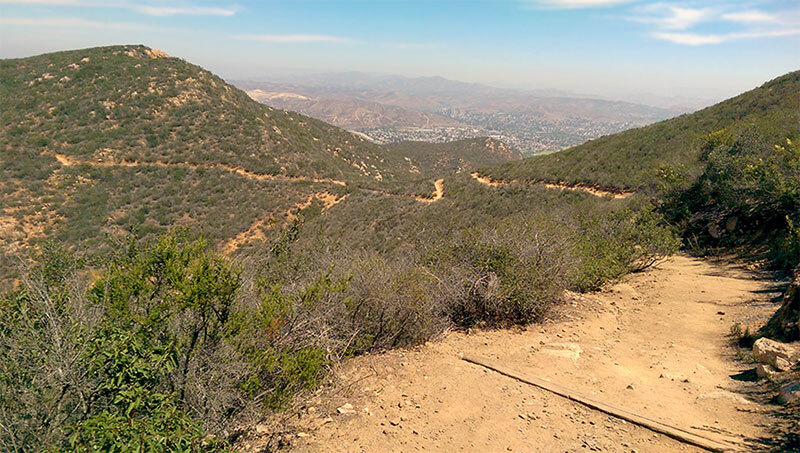 The extra mileage and elevation gain challenges you just enough to give you that sense of accomplishment that’s often lacking in the short hike to Cowles. It’s also a great way to escape the crowds and enjoy the views in relative seclusion.